AUSTIN, Texas, Nov. 18, 2015 - The National Institute of Computational Sciences (NICS) at the University of Tennessee today became the 13^th^ member of the iRODS Consortium, the membership-based foundation organized to sustain the integrated Rule-Oriented Data System (iRODS) as free open source data management software. The newest consortium member was announced in the RENCI booth (#181) on the SC15 show floor at the Austin Convention Center. NICS, a National Science Foundation-funded high-performance computing center that provides computational resources for more than 1,000 users, is the seventh new iRODS Consortium member this year. Other members are the Wellcome Sanger Institute, Cleversafe, DataDirect Networks (DDN), EMC Corporation, IBM, NASA’s Atmospheric Science Data Center, Novartis, Seagate, RENCI, University College London, Complete Genomics, and the Data Intensive Cyber Environments (DICE) group at UNC-Chapel Hill. 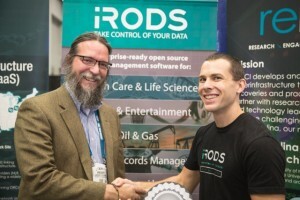 Thousands of businesses, research centers, and government agencies worldwide use iRODS for flexible, policy-based data management that provides long-term preservation and federation. Organizations in the U.S., Europe, Asia, South America, and Africa use iRODS to manage data used in genomics (e.g. the U.K’s £9 million eMedLab collaboration), climate research (e.g., NOAA’s National Climatic Data Center and NASA’s Center for Climate Simulation); and seismology (e.g., the Southern California Earthquake Center). National and regional-scale libraries, such as the French National Library and the Texas Digital Libraries, also use iRODS to control their data. The iRODS development team, based at the University of North Carolina’s Renaissance Computing Institute (RENCI) will present iRODS demonstrations at the RENCI SC15 booth (#181) throughout the remainder of the conference. Other demonstrations using iRODS demonstrations will also be presented in the EMC booth (#499) on Wednesday at 2:30 p.m. and at the DDN booth (#633) on Thursday at 12:30 p.m.